The “Save Our Arts” benefit at Motorco Music Hall is designed to support the arts education programs both at Central Park School and the greater Durham community. 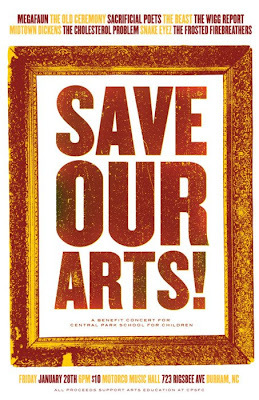 Donations will help build funding for student art supplies, staff development for arts education, arts based field trips for workshops, gallery visits and performances, as well as artist-in-residency grants. All for $9.19 presale or $10 at the door. This all ages show starts at 5pm.